Looks a bit homemade or possibly for a store. I'm 100% its not a home made job... I was also thinking a shop display of some sort. 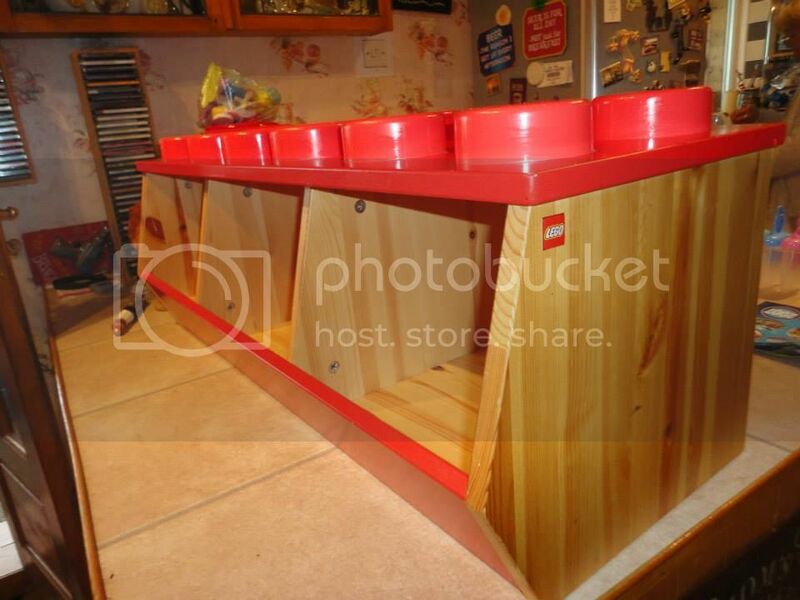 If I'm right, those are storage bins that Lego offered for sale about 10 years ago. Nice stuff but darned expensive. I've searched the internet for a couple of weeks now without any result, I'm thinking maybe it's a rare find.... Someone must know for certain what this is. It's an official LEGO product - LEGO stacking bin 60021 (the red in your pic) or 60020 in green from 2007. You can reference them on Bricklink. Your pic jogged my memory because I remembered having my order cancelled for the storage bin when it went on 75% discount way back when. They weren't store displays, more like a line of furniture that included a stool, toy chest, and building table. I do have the rolling storage boxes in red and blue -- 60030 and 60031-- and while horribly expensive, those boxes were made in Finland and of solid wood, not MDF. Thank you Streeker, I'm pleased someone managed to help! I knew it was a quality bit of kit.... Well worth what I paid for it!